While CNC routers are not necessarily a technology you would call “new” they are newer than some other CNC machines and concepts. 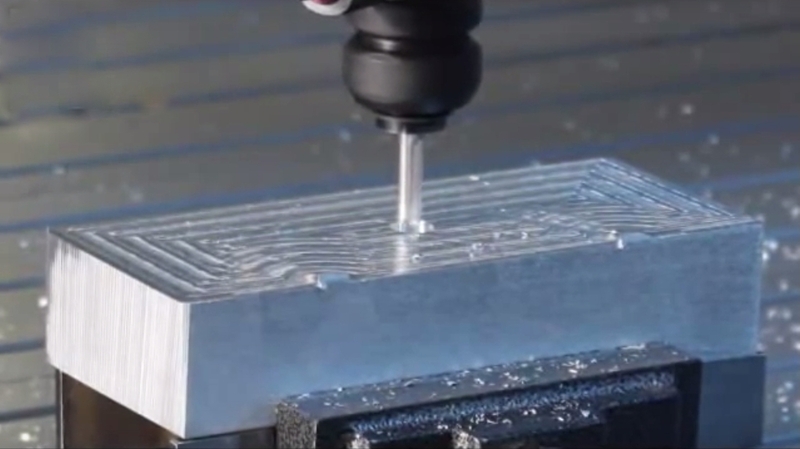 Older and more established CNC technologies, like mills, are able to cut metal with exact specifications regarding chip load or Speeds and Feeds. Metal has far less variables than wood so it is easy to calculate the chip load to an almost exact number every time when doing metalwork. The work conditions for woodcutting operations are not nearly as consistent. Even when you work with the same type of wood the material can vary in density based on the growth of the wood when the tree was cut down, impurities in the wood and other factors. Hold-down methods used with wood are less consistent than the methods available for metalwork. Additionally, cooling systems can almost never be used for woodworking because exposure to moisture can change the shape of the wood during the cutting process, throwing off the results of your work and possibly ruining a project completely. As a result, machinists must pay careful attention to the level of heat generated during cutting processes or else risk shortening the life of their tools and damaging their projects. There are numerous chip load calculators that you can find online so that doing this work becomes faster and easier than if you calculate it by hand. Because of the many variables of wood there is no go-to, easy solution for figuring out the exact parameters you will need to set on your machine. You could not just look up “best CNC settings for pine” and find the perfect settings for your machine when cutting pine. You can, however, follow a little checklist in order to determine what settings you need to make the best possible cuts that your machine can manage. Start by taking the hold-down methods you have available into consideration. Different vacuum systems and other hold-down methods will have varying effects depending on just how your system is set up. It is good to check your hold-down systems frequently as you may get changing results as your machine ages and starts to wear down. Think about how big the part you are going to machine is; smaller parts are more likely to move when the cutter makes contact. Take the geometry of your tools into account. For example, up-shear tools have great tool life but can cause a part to move if they overpower a vacuum hold-down system. Determine how deep your cuts will be to decide on the number of passes you will make. The deeper a cut the slower a feed rate should be. This may wreak some havoc on your tool life but it is that or a low-quality part. You should start at a low feed rate and work your way up. Do not start too slowly though, that can generate as much heat and cause as much damage as going too fast. Keep going until you notice a little damage in your test material, then dial the feed rate back a bit and you should have your optimal settings. Impurities in wood (such as knots) can cause some issues and be difficult to cut through. You will generally need to cut more slowly than usual to get through trouble areas like this. Additionally, you will want to ensure that you use a particularly sharp tool and it also helps to lubricate it so that the blade will not gum up while cutting through the tougher areas of your material. 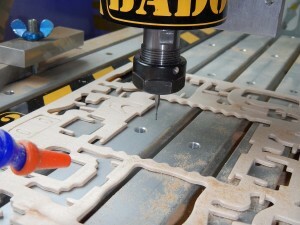 Individuals who are interested in the application of high speed wood cutting may also find this article interesting and useful: https://hal.archives-ouvertes.fr/hal-00881899/document. Decorating eggs is an age old past time for children, especially in the spring when it starts getting close to Easter(easter egg design). Traditionally, you would take an egg and color it by hand. But like many older past times, this task has been made faster, better and more efficient through the innovation of modern technology. This particular CNC machine may have a very specific function but it is a basic machine that serves as a good way to teach CNC technologies to children and young adults. The name of this machine is the EggBot. There are a decent number of hobbyists out there who build their own machines from parts instead of buying a whole one. Some folks enjoy buying individual parts from the store or suppliers to build the machine from scratch while others just want to buy a DIY kit and assemble that; your options regarding these choice might be limited depending on what type of machine you are working with and what kinds of options are available for that type of machine. S hobbyists who already have a CNC machine, 3D printer or something similar may want to try other machines out but find that buying or building a whole new machine is outside of their budget. If you are creative enough you can build just about anything using your machines so why not 3D print a CNC machine, or use a CNC machine to make a 3D printer? Routing acrylic materials (Plexiglas, Lucite, Acrylite, Perspex, etc.) is one of the most popular methods used in the fabrication of this type of material. A high quality standard kept for the material regardless of how it will be used is routing the product with a fine finished edge, eliminating the need for finishing the item after it has been routed. There are a number of key factors you will need to take into consideration to keep your finish high-quality, two of the most important factors being tooling and programming. There is a lot that could be said about tooling if we were to get into specifics but there are some more basic guidelines you can follow for acrylic routing. When you are choosing which tool to use the first criteria that affects your choice should be diameter. On a lot of jobs clients commonly have requests that will require you to use tools that are 1/8” to 1/4″ in size. Using larger tools, from sizes of 3/8” to about 1/2″, will result in consistent surface finish results that are superior to smaller tools. The increased stability and flute depth of tools with larger diameters cause the increase in quality. Any tool that is larger than 1/2″ will only improve your results slightly and as you use larger and larger tools the size increase will eventually do more harm than good. Using anything bigger than 1/2” is unnecessary. Additionally, your cut depths should not exceed 2”. Once you have selected your diameter the next thing to choose is cutter configuration. Generally speaking, the smaller the diameter of your cutter the more likely it is that a spiral configuration will leave a good finish. When you use larger tools (3/8” and up) a straight flute works better. If you are using a tool that is 1/4″ or smaller a single edge spiral O-flute will give the best finish. At larger sizes low helix multi-fluted tools work better (the exact type of tool you will need depends on if the acrylic is cast or extruded and on any fillers that may have been used in the material’s manufacturing). These are the sizes where you will want to use double edge straight tools. O-flutes and V-flutes can both work well when using tools of these sizes. In addition to these conventional tools there are also some specialty tools on the market for this kind of work so it does not hurt to do a little research and see what is available. When you are programming it is key to select the correct cutting methods and cutting parameters. Every different combination of material and cutter will have its own “sweet spot” that you want to hit for ideal machining. Your feeds and speeds are going to be the most sensitive parameter while you are programming. Acrylics (and other plastics) have a very small chip load range that you need to find in order to maintain a sufficient finish. Each cutter is going to have its own optimum chip load for every different type of material. You need to look up the feeds and speeds that you will need or, if that is not possible, experiment until you find the right configuration. Once feeds and speeds are settled you will select your cutting method. Conventional and climb cutting are both good but tools with larger diameters work better with conventional cutting. With smaller diameters the cutting method you need will depend on the material; you will have to do some trial-and-error work to figure out what works best. If you are new to working with the type of acrylic you are using some trial-and-error experimentation will be necessary to figure out a lot of parameters like finish passes, depths of cut and entry points. There is a lot to learn about this type of work but with time and practice you will get the hang of it and be machining like a pro in no time. Some hobbyists may ask if a CNC router can cut aluminum(Aluminium Cutting) since you most often see other users cutting wood or plastic. You can use your CNC router to cut aluminum if you know how to do it right. Aluminum (and other metals) are different to cut compared to wood or plastic. They have a smaller “sweet spot” for optimal cutting. If you leave the sweet spot your cutter will start breaking and wearing out faster and the surface finish will not be very good. Another thing to keep in mind is the “stickiness” factor (this applies to some other metals too). Aluminum wants to stick to your tool. It will do this to the point where it welds itself to your tool(tools). When sticky bits of aluminum have clung to your cutting edges your tool is not going to have much more life in it. 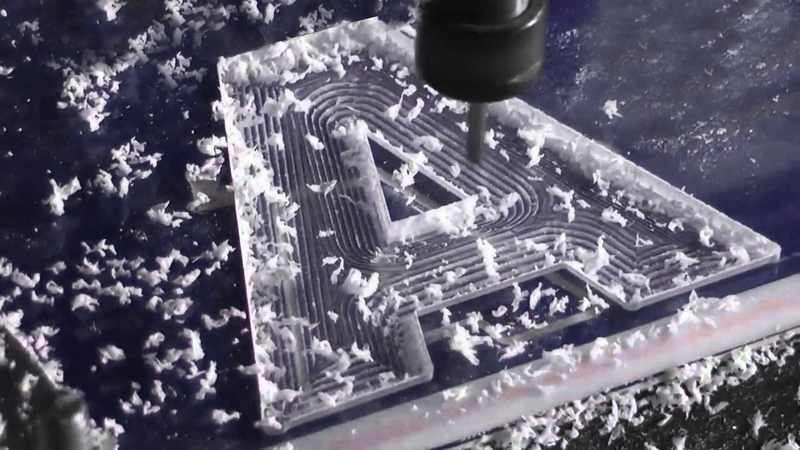 Even though it is challenging you can cut aluminum on almost any CNC router. This article will give you a few tips to make sure you stay on track doing that job safe and proper. While a CNC router can cut aluminum it is not the best tool for big parts, like vehicle parts. To cut successfully you need to do the job slowly. Just let your machine do its job and do not be in a rush. Cutting aluminum is not easy and will probably push your CNC router to its limits(Aluminium Cutting). Use a Feeds and Speeds calculator to optimize your settings so that you are not dodging the tip of your cutter that broke off and is flying across the room. Ideally you want to use a calculator that takes minimum RPM, CNC router cutter types, deflection, rubbing warning and chipping thinning into consideration. Your first problem will be recommended RPMs being too low. A CNC router cannot always go as slow as you want to go for cutting aluminum but there are ways to bump you’re the recommended RPM and fix this problem. The first tactic is to user cutters that are good at high speeds. The measurement to look for is Surface Speed which is high is carbide cutters. Cutters like HSS and Cobalt will be too slow so look for carbide TiAIN coated cutters. They cost a bit more but the improved results of your project will be worth it. Say you were using an HSS Endmill and the recommended RPM is 5877. Your CNC router’s spindle may have a minimum speed of 20,000 RPM (this is a very common minimum speed for routers). A TiAIN Carbide Endmill may have a recommended RPM of 16,897, putting it much closer to your machine’s minimum RPM. For aluminum try to get as close to 20,000 RPM as you can and you should be fine. Another way to increase RPM is using small diameter cutters. The largest cutter you want to use should be ¼” but go smaller than that if you can. You will most rigid cutters to stop tool deflection from being a problem (this is where having tool deflection on your calculator becomes important). The smaller your cutter is the closer you can get it to 20,000 RPM. Be extra careful about clearing away chips. Recutting chips is an easy way to break a cutter. Be paranoid about this and do not just assume that your dust collection system is good enough without testing it for this first. It will be harder to get chips out as you cut deeper. Make more passes to cut down as far as you need to and you will open up shallower depths for better access. Lubricate your tools that that the chips will not stick to your cutting edges. The best way to do this is with a mister if you can set one up. Now you need to think about avoiding tool rub. Going too slow with your federate can cause this to happen. Using your calculator should let you dodge this but be careful because the high speeds of your CNC router can result in tool rub happening easily. It can even start to happen while you are unaware that it is going on. If you cannot feed fast enough use fewer flutes. You should use a maximum of three flutes at once regardless. Using few flutes is good and is the reason 1 flute cutters are sold. There is a lot to remember when cutting aluminum but once you know what you are doing you should be able to use your CNC router for aluminum projects safely and accurately.